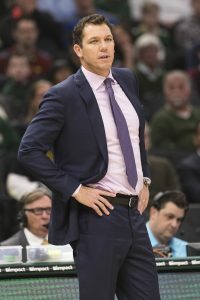 APRIL 15: The Kings have officially hired Walton as their new head coach, the team announced today in a press release. APRIL 13: The Kings will hire Luke Walton as their next head coach, tweets Sean Cunningham of ABC10 in Sacramento. Walton and the Kings have agreed on a contract that will run through the 2022/23 season, tweets Sam Amick of The Athletic. Sources tell Cunningham that the search moved quickly because of GM Vlade Divac’s fondness for Walton, whom he wanted to hire in 2016. Other candidates for the job were told they would only get an opportunity if negotiations with Walton fall through, per Amick (Twitter link). Sacramento’s front office asked Walton to interview with them yesterday and was reportedly also seeking permission to talk with Spurs assistant Ettore Messina. Walton compiled a 98-148 mark in three seasons with the Lakers before mutually agreeing to part ways with the organization. The Kings are about to hire their seventh head coach of the decade after their surprising decision to fire Dave Joerger on Thursday. Joerger won 98 games in three seasons and had Sacramento in the playoff race for most of the year. 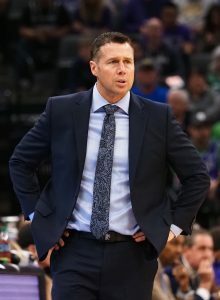 The team’s 39-43 record under Joerger in 2018/19 was its best mark since the 2005/06 season. Walton has spent the last three seasons as the Lakers’ head coach, compiling a 98-148 (.398) overall mark with the franchise. Walton technically improved his record every year as the Lakers’ coach, winning 26, 35, and 37 games in his three seasons. However, this season’s squad, hit hard by injuries and negatively impacted by the midseason Anthony Davis trade-rumor saga, fell well short of expectations following last summer’s acquisition of LeBron James. The Lakers’ underachievement resulted in Walton’s ouster this week, even with Magic Johnson no longer running the show in Los Angeles. However, it didn’t take the former Warriors assistant long to find a new head coaching job. Jason Jones of The Athletic examines how new head coach Luke Walton could make the Kings a better team. 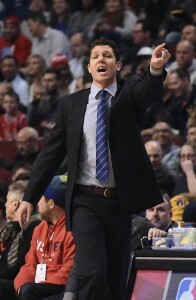 Walton, who was hired by the team one day after mutually agreeing to leave the Lakers, holds a strong record with several NBA players and officials. He was an assistant on the Warriors’ 2015 championship team, proving his worth as a coach under Steve Kerr and registering interest from multiple teams around the league at the time — including the Kings. The Kings’ sudden decision to fire head coach Dave Joerger caught him by surprise, agent Warren LeGarie told Jason Anderson of the Sacramento Bee. “Obviously, it’s a great disappointment,” LeGarie said as part of a larger statement. “Dave thought, in light of the youth of the team and other challenges, he did a good job, certainly one that other people have recognized around the league. And, more importantly, exceeded expectations.” Joerger spent full three seasons with Sacramento as coach before being dismissed. 12:27pm: The Kings have now fired Joerger, officially announcing the decision in a press release. 11:08am: Kings general manager Vlade Divac is having a face-to-face meeting with head coach Dave Joerger today and intends to fire Joerger during that sitdown, league sources tell ESPN’s Adrian Wojnarowski (Twitter link). It’s a somewhat surprising move, given the success Joerger had with the young Kings this season. The club was in playoff contention through the All-Star break and finished with 39 wins, the most victories a Sacramento team has had since the 2005/06 season. Under Joerger, guards De’Aaron Fox and Buddy Hield enjoyed breakout seasons, with young players like Bogdan Bogdanovic, Harry Giles, and Marvin Bagley also showing promise. However, the Kings slumped at the end of the season, going 9-17 down the stretch and losing some games that they shouldn’t have. Additionally, Joerger reportedly had some tension with the team’s front office throughout the year related to minutes for young players, and notably clashed with assistant GM Brandon Williams. An earlier report from Sam Amick of The Athletic (Twitter link) indicated that Williams won’t be back next season either. In three total seasons with the Kings, Joerger posted a 98-148 (.398) record, with no playoff appearances. He previously coached the Grizzlies for three years, posting a 147-99 (.598) regular-season mark in Memphis, with a 9-13 record in four playoff series. Joerger had one year remaining on his contract with the Kings. Wojnarowski suggests (via Twitter) that Divac, with a new contract extension in hand, is “consolidating power” around himself in the Kings’ front office. He’ll presumably take the lead in picking Joerger’s replacement. According to Marc Stein of The New York Times (via Twitter), Luke Walton would be a top candidate for Sacramento if the Lakers let him go, though Walton isn’t necessarily a lock to be replaced in L.A. now that Magic Johnson has stepped down. ESPN’s Zach Lowe (via Twitter) also identifies Spurs assistant Ettore Messina as a name to watch in Sacramento, while Amick (via Twitter) adds Sixers assistant Monty Williams to the list of potential candidates for the Kings. As for Joerger, the Minnesota native has frequently been linked to the Timberwolves’ head coaching job, as Lowe notes (via Twitter). However, there’s a belief that Ryan Saunders might hang onto his position with the Wolves — that situation is in flux, as Minnesota seeks a new president of basketball operations. 10:37am: The Kings have issued a press release officially announcing Divac’s extension through 2022/23. 10:29am: Divac is pushing to consolidate his power as the Kings’ top basketball executive and is seriously weighing the possibility of dismissing Joerger, reports ESPN’s Adrian Wojnarowski (via Twitter). According to Woj, Divac and Joerger will have a meeting today. Meanwhile, Divac is currently meeting with Williams and has decided that the assistant GM won’t be retained for next season, per Amick (Twitter link). 8:21am: The Kings have reached an agreement on a contract extension with general manager Vlade Divac, sources tell Sam Amick of The Athletic. According to Amick, Divac’s new deal will run for four years, keeping him under contract through 2022/23. Previously, his agreement with the team was set to expire in 2020. 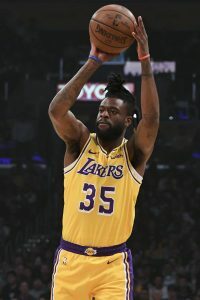 Although the Kings couldn’t snap their league-high 13-year playoff drought this spring, the franchise showed promising signs of growth, with second-year point guard De’Aaron Fox and third-year shooting guard Buddy Hield both enjoying career years and exhibiting All-Star potential. Other young players like Bogdan Bogdanovic, Marvin Bagley, and Harry Giles also took steps forward, and Sacramento was able to add forward Harrison Barnes at the trade deadline. All of the Kings’ core players were acquired by Divac’s management group. With the general manager now locked up to a long-term deal, the focus in Sacramento will now shift to head coach Dave Joerger, whose fate rests “solely in Divac’s hands,” sources tell Amick. Joerger has one year remaining on his own contract. While the Kings exceeded expectations this season, the team didn’t finish particularly strong, losing 17 of its last 26 games, including a few defeats at the hands of clubs that didn’t seem to be trying too hard to win, Amick notes. Joerger also clashed with assistant GM Brandon Williams earlier in the season. Based on those factors, league insiders don’t view Joerger as a lock to return, per Amick. Marc Stein of The New York Times first reported that the Kings and Divac were expected to explore an extension at season’s end. The Kings are expected to open contract extension discussions with general manager Vlade Divac following the club’s regular season finale, reports Marc Stein of The New York Times (Twitter link). Divac’s current deal runs through the 2019/20 season. Although the Kings couldn’t snap their league-high 13-year playoff drought this spring, the franchise showed promising signs of growth, with second-year point guard De’Aaron Fox and third-year shooting guard Buddy Hield both enjoying career years and flashing All-Star potential. Other young players like Bogdan Bogdanovic, Marvin Bagley, and Harry Giles also took steps forward, and Sacramento was able to add forward Harrison Barnes at the trade deadline. 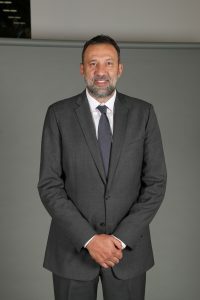 With the Kings pointed in the right direction, Divac – once a target for constant criticism – deserves much of the credit for the team’s transformation, as all of the core pieces on the current roster were drafted or acquired by his management group. While Divac appears to be in line for a new deal, there’s still some uncertainty surrounding head coach Dave Joerger and assistant GM Brandon Williams, Stein tweets. Joerger and Williams reportedly clashed this season, raising questions about whether the duo can coexist going forward. Joerger’s current contract also expires after the 2019/20 season, and NBA teams rarely ask their head coaches to enter a season on lame-duck deals, so it will be interesting to see if Sacramento also looks to extend Joerger this offseason.